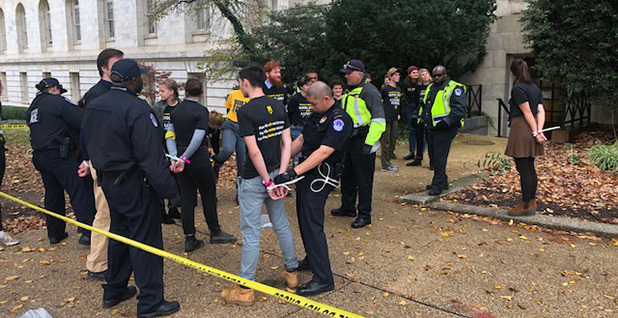 More than 200 protesters laid siege yesterday to the office of House Minority Leader Nancy Pelosi and demanded that Democrats make climate change a top priority when their party takes control of the House next year. But the raucous scene wasn't the biggest headache for Democratic leaders — despite the deafening chants, the 51 arrests or even the blessing of incoming Rep. Alexandria Ocasio-Cortez (D-N.Y.), a rising star on the left. Instead, the larger concern for top Democrats might be the demands themselves. Rather than ask for pie-in-the-sky proposals, liberal protesters led by the youth-driven Sunrise Movement argued that their two requests are attainable even with Republicans set to maintain control of the Senate and White House. And that's what could put Democratic leaders in a bind with the party's base. "The only thing that's standing in the way right now is the lack of courage from our political leadership," said Varshini Prakash, co-founder of the Sunrise Movement. First, Prakash said, they want every incoming member of House Democratic leadership to refuse donations from the fossil fuel industry. And second, she said, their hope is to convince Pelosi and House Democrats, at a minimum, to write a bill that would envision a new federal program — dubbed the Green New Deal — that would accelerate the country's transition to renewable energy sources. "We're not asking for her to draft and pass the legislation in both houses [of Congress] over the next two years," Prakash said. Rather, she said, she wants Pelosi to start building consensus for the idea now, so that if Democrats "get power in 2021 and beyond, we can actually pass these types of policies." "We have 12 years to actually tackle this crisis, and if we don't start now, our generation is going to be completely screwed," Prakash, 25, said, in reference to a recent U.N. report that raised alarms about the short time left to address climate change without catastrophic consequences (Climatewire, Oct. 11). In response to the protests, Pelosi put out a statement that highlighted her desire to bring back a select committee to address climate change. She also spoke positively of a new infrastructure program that would steer money toward global warming resilience. "House Democrats ran on and won on our bold campaign for a $1 trillion investment in our infrastructure that will make our communities more resilient to the climate crisis, while creating 16 million new good-paying jobs across the country," Pelosi said. But those overtures may not be enough to assuage climate activists or even some members of her caucus — a situation that could complicate Pelosi's bid to reclaim the mantle of House speaker. Democrats and Republicans currently are in the process of picking their leaders for the next Congress, and several incoming freshman Democrats already have said they wouldn't back Pelosi for the chamber's top job or are considering voting against her. Among the skeptics is Rashida Tlaib of Michigan, who said during the campaign that she would "probably not" vote for Pelosi, but later was noncommittal in a statement to The Detroit News. She wrote yesterday on Twitter that she supported the protests outside Pelosi's office. "It was an honor to join hundreds of young people from @sunrisemvmt this morning to demand that as @TheDemocrats, we lead on this crisis and demand immediate climate action!" she wrote. "We need a #GreenNewDeal!" As part of their runs for Congress, both Tlaib and Ocasio-Cortez vowed to not accept campaign contributions from the fossil fuel industry. At least 15 congressional incumbents took a similar pledge during the midterm elections, and the issue was a point of contention this summer among Democrats (E&E Daily, Sept. 7). At the urging of Christine Pelosi — the minority leader's daughter — the Democratic National Committee briefly barred donations from political committees tied to the fossil fuel industry, only to backtrack a few weeks later on concerns it would turn off sought-after voters and donors in that sector. A similar tension likely would come into play if activists make traction with their effort to get new Democratic leaders to reject fossil fuel money. And it remains to be seen whether groups such as the Sunrise Movement can win more converts among incumbent Democrats. Rep. Frank Pallone (D-N.J.) was one of several lawmakers and staff members caught up in the protests outside Pelosi's office. Asked what he thought of the activism, Pallone — the top-ranking Democrat on the Energy and Commerce Committee — said simply: "I don't know anything about it."